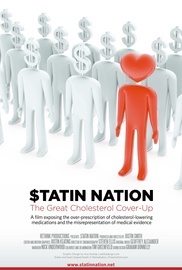 Statin Nation exposes the medical corruption that has led to millions of people needlessly being prescribed cholesterol-lowering medications. Statin Nation reveals the medical corruption that has led to the mass overprescription of cholesterol medications (statins). The film explains how the facts about cholesterol and heart disease have for decades been distorted by pharmaceutical companies keen to increase their profits. Cholesterol-lowering has become a huge global industry, generating around $29 billion each year.